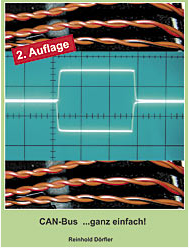 The 52-pages booklet published by Dörfler Elektronik (Germany) is available in the second edition. It is an introduction into CAN basics for apprentices and mechanics new to electronic. The author explains the CAN technology in a simple way. Thus, the booklet may be used as a support document for scholars beginning to deal with CAN. The booklet explains the principles of CAN such as message format, bus arbitration and error check by comparing it to e.g. a telephone line with several apparatuses. Illustrations help visualize bit sequences of the CAN telegrams and explain e.g. bus arbitration in simple language. Simple hints for automotive trouble-shooting are given, too. The brochure is well-suited for absolute beginners to CAN without any background in electronics. Those with electronic or communication background should prefer a detailed text-book or visiting a CAN seminar. The brochure is available at the company’s web site for 17,80 Euro plus postage.